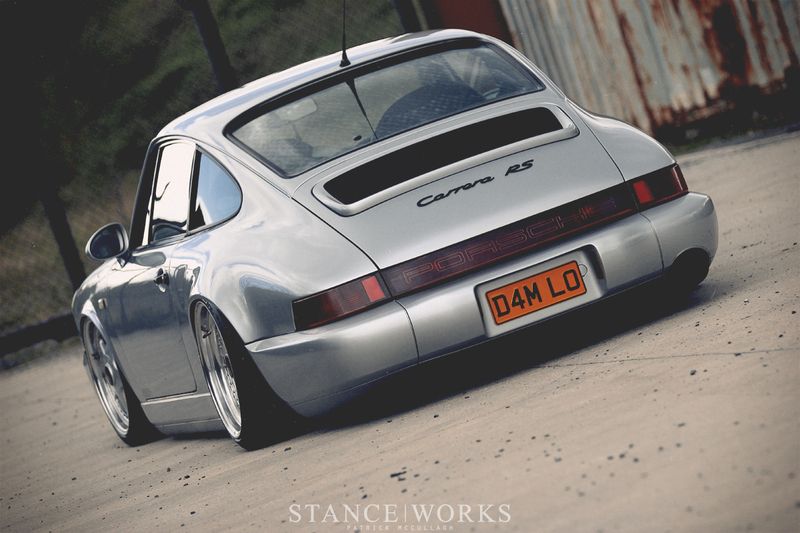 The Porsche 911 has a certain draw to it. Seemingly any owner will tell you that the body lines of the world-famous marque prove irresistible and that no substitute will do. John Peden is no different - the Northern Irishman had longed for a Porsche since his younger days, suggesting that the sloped tail and perched headlights stood as a source of inspiration for years on end. In 2008, the chance to put himself behind the wheel of a P-Car became a reality: John purchased a 996 and immediately began tearing in to it. 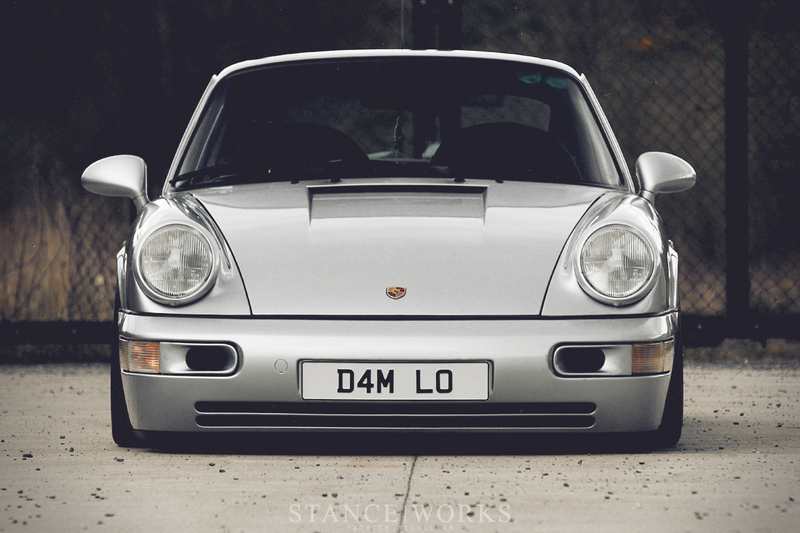 "I set about converting the bodywork of the car into a 997... but even then, while it was a great car, it just wasn't right. It didn't have any character." And as quickly as the 996 had come in to his life, it was gone. John knew what he truly wanted - something with a balance between classic aesthetics and modern mechanics, and the 964 was firing on all cylinders. But John wanted more than just any 964. He wanted something very specific. "I knew exactly what I wanted. It had to be polar silver with a black interior with the RS touches." But as anyone who has sought out a particular colorway has undoubtedly figured out for themselves, finding the right car was far more of a challenge than John had initially expected. After realizing that the chances of finding the car he was after ranged between slim and none, he bit the bullet and bought the first car he came across on eBay. Sight unseen, John made the payment and had the car shipped from England to Norther Ireland. The 964 John purchased was far from what he was truly after. The porker was blue over blue, and in rough shape, all things considered. But after taking the car for a spin once it had arrived, John knew he had made the right decision. However, the hard work that lay ahead of him was all familiar territory. John has been a suspension and bodywork specialist since he left school, and his years of work and practice could finally be put to use in his "dream" build. "I've had all manner of random creations over the years, built a few feature and cover cars... so I was in a good position to be able to make this Porsche exactly how I wanted." John began with the interior - he pinned it as one of the most important aspects of the car, as he wanted it perfect and decidedly wanted to feel at home in the old gal. He stripped the car down and sent every piece imaginable off to S.L. Auto Interiors for an overhaul. Aside from the seats, every interior component was made specifically for this car, from the headliner to the carpet. As an audio buff, John took the car to Audio Advice, who made the custom door panels and sub enclosure where the rear seat had used to be. "I can't take any credit for the interior. I told them what I wanted and the guys produced the goods." What John can take credit for, however, is the entirely unique suspension system. Many will be quick to assume that the Porsche has attained its style thanks to air suspension - but they've missed the mark. 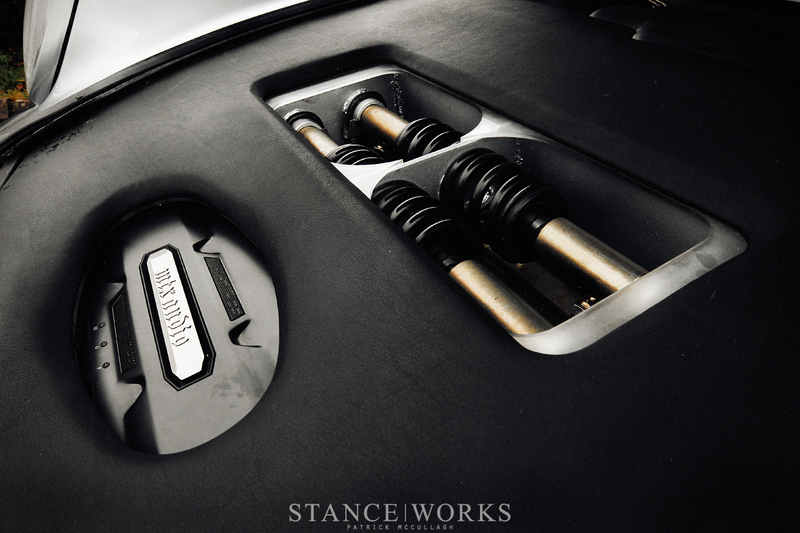 While John is more than familiar with air suspension, his specialty is the black art of the stance world: hydraulics. However, John is quick to add in that it doesn't run the standard hydraulic & accumulator setup. Instead, John has taken a different approach with an aim to maintain the performance of a coilover system while still treading his own path. To accomplish this, John utilized a Rayvern Hydraulics system to place four remote rams under the front bonnet which displace the suspension loads on to four individual coil springs which are matched to the weight of the vehicle. While that's likely gibberish to most, its an intricate yet simple way to blend dynamic and static suspension systems which produces a ride quality and handling characteristics that are very similar to that of a typical coilover system. Drawbacks? "I'm not really sure there are any," John says. While a purpose-built coilover system will certainly outperform John's alternative, the advantages are left to those who corner-balance their cars for the track - few and far between. "One problem I did have was that the alignment is very critical on a Porsche, and having no gauges with hydraulics, it's hard to determine the height." To solve the issue, John built a custom wiring harness to adapt the signal from a digital air suspension management system, allowing him to control the hydraulic suspension electronically, and more importantly, with accuracy, from inside the car. "It's probably the best improvement I've made along the way." The completed package has culminated into a car that John truly loves driving. When it came to the car's bodywork, John stripped the entire car down to achieve the perfect finish. Whatever the car needed, the car got; John didn't hold back. Aside from a color change to the silver he had longed for, and the addition of air ducts up front, the exterior was left alone, ignoring of course his choice in wheels. In the past, a set of 18" replica Speedline wheels were bolted to the car, but after a puncture tire in a size that was discontinued, John was left stranded. The all-wheel-drive system is finicky when it comes to proper tire sizing, meaning John couldn't simply fit a different set of tires to the back of the car. Instead, he made the plunge and bought a set of 17" OZ Futura splits. While his initial investment in to the wheels was a bargain, after replacing the lips and barrels, John was in them for a pretty penny. The 8.5s and 9.5s are wrapped in 215/40s and 245/35s respectively. 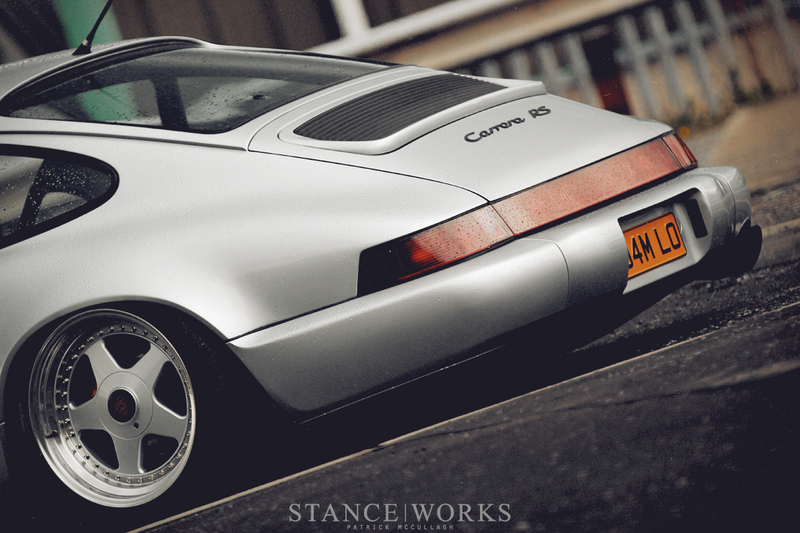 "The way the wheels sit in the arches is obviously my favourite part about the car... But I do love the interior as well, I feel special in it!" It comes as no surprise that such a unique car polarizes its target audience. "I've heard it all before... but I didn't build it for them, and I'm not bothered." With the Porsche crowd, it's hit-or-miss, but with us, this P-Car earns nothing but respect. John says that the car is complete, and now it's time to enjoy driving it. As for what's next, we're as unsure as anyone else. "Cars play a big roll in my life, sometimes too much, seeing as I modify cars for customers for a living. But I still get a kick when I'm setting something on the floor for the first time." That's exactly what we're after. Delighted to shoot such an awesome car for StanceWorks. 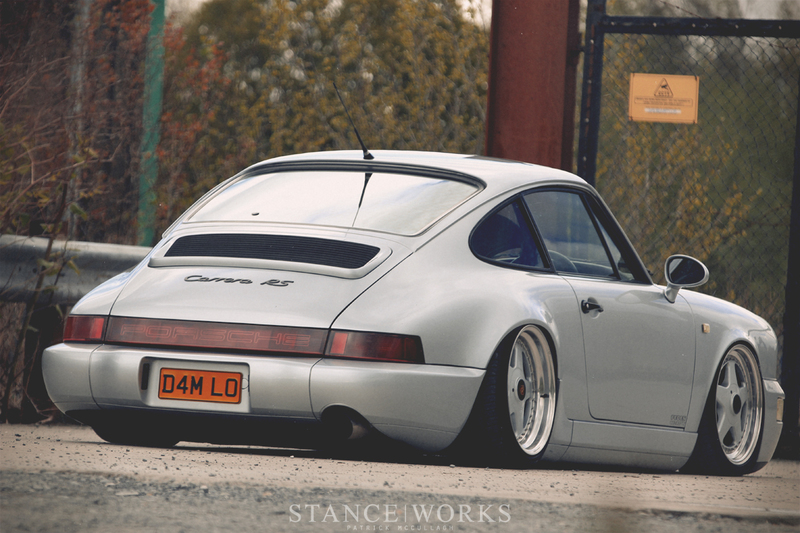 Kudos for fixing up an old 911, but he took a lightened, track-oriented 964 and proceeded to add weight and make it less track oriented. At least he didn’t go all “RWB” on it. I’m a fan of massive customization but I really don’t like any of the choices he made. No frunk, terrible audio stuff taking up the whole back seat, changing the car from an interesting color to a boring one, that hideous steering wheel, and those stupid low-profile tires take any aggression out of the look. I’m just glad the owner is happy with how it came out. P.S. That last sentence is serious, I would hate to hear that he sells it in like 6 months. @petite pounder Amazing. You’re that lustful for an argument you insult someone pride and joy, beside the fact you’re on a “stance fourm”. Stance..kindof has its place. 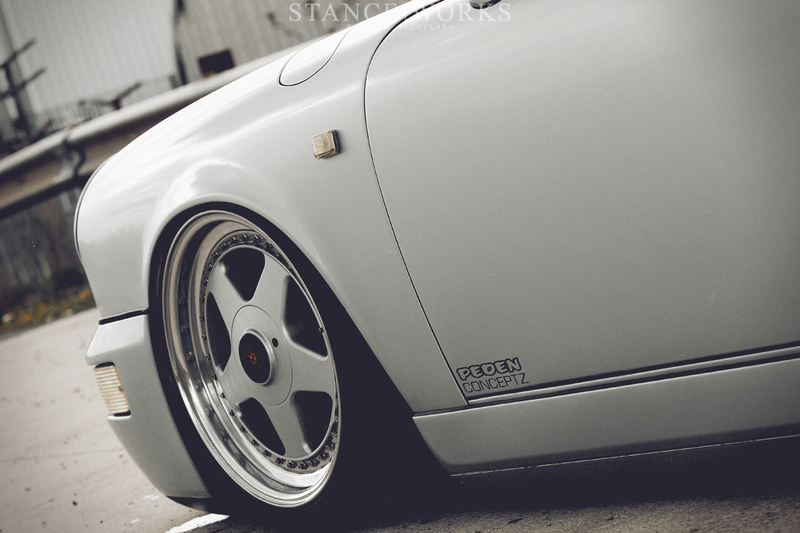 Not all stance is iether crazy camber or ruined performance cars. I’m just here for the rare pic of a somewhat lowered car that looks good. @AJKAJK if you cant take the heat, get out the fire. @petite pounder like he said, perhaps you are not on the right website? Amazing, you managed to miss use an idiom. Besides, your comment wasn’t even directed at me. Enjoy driving your beater bro. @AmericaMan He won’t. The owner has been modifying cars for years and has heard it all before and from every quarter. People may cry and cringe that John has done this to his Porsche but what I respect him for is the fact that he does things his way. Too many people in the stance game (car modifying in general) do what they do to be popular or to keep up with the latest trends – buy a car, modify it the way everyone thinks it should be done, get your feature and then sell up and on to the next project. 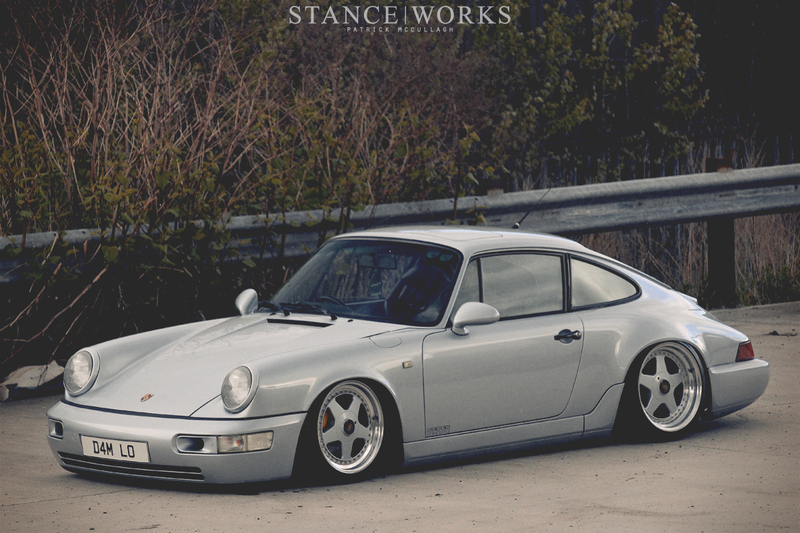 John had this vision for the 964 long before he actually bought the car and started working on it and that was 4 years ago. @PatrickAutolifers @AmericaMan That’s good to hear. People do it all the time in the american muscle car scene. Dump a ton of money and effort into a car to get it so nice you can’t even drive it then sell it at Barrett Jackson for a huge loss. I don’t get it. @AmericaMan @PatrickAutolifers yeah its crazy. For me personally I pick a car and I have one single vision for it. Then I try to get there. My most recent purchase I will never sell. I have my idea and i cannot wait to see it completed. The car will never be sold as I love it! @PatrickAutolifers oh wow, i just realized you’re the one who shot this article. Nice photos! It’s truly beyond me that people still hate knowing that the fitment scene is one about personal preference. Would I do that to the car? Probably not, but im still stitting here drooling at the last pic. Car is art props to the owner, everyone that did work on it and the photographer especially the third to last pic, just awesome. @Jalopnik and DRIVE It’s not a real RS ..
Now-a-days car had many techniques than early. To improve the efficiency of the car hydraulic cylinder and brake is installed. So mechanics have to know all the techniques.